With Thanksgiving only sixteen days away it is time to start thinking about the menu. It’s Oven Roasted Turkey Time! This year I am hosting my first official Thanksgiving dinner. I AM SO EXCITED! Like any good thespian, I had to have a dress rehearsal before the big show so I invited a group of friends over to break bread with. I am happy to report that my trial Thanksgiving run was successful. Lucky for me and lucky for you because over the next two weeks I will share my favorite Thanksgiving-worthy dishes with you. Obviously, we will start with the turkey. Don’t stress about the turkey! Just remember that a turkey is basically a giant chicken. 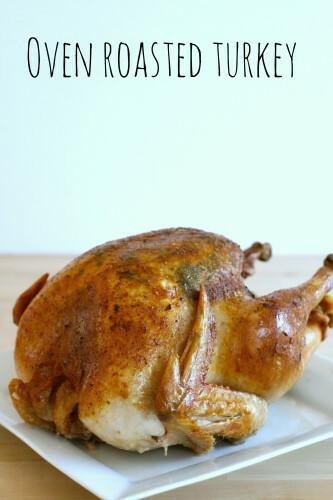 Have you roasted a chicken before? 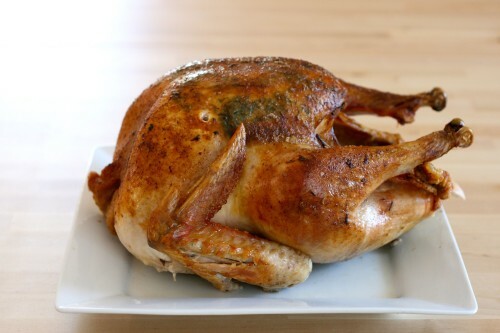 Then you can do an oven roasted turkey no sweat. Just to make sure I wouldn’t mess things up I consulted my favorite site The Kitchn. When it comes to cooking a turkey there are about a bajillion ways to do it. I kept it super simple. I let it thaw in the refrigerator for five days before roasting and I totally skipped the brine (the horror!) since I didn’t have a large enough container to brine it. My turkey still was juicy and flavorful without the brining step. I chopped up some of my favorite herbs and combined them with softened butter and rubbed them under the turkey skin giving the meat lots of flavor. Periodically throughout the roasting time, I basted the turkey with the drippings to help keep it from drying out. These drippings included a little chicken stock and a cup of chardonnay. I couldn’t be happier with the end result. And the gravy was fabulous! Questions about thawing your turkey? Check out the USDA guidelines. HAVE YOU ROASTED A TURKEY BEFORE? Share your tips, tricks, success stories, or failure stories below. I’d love to hear them! To ensure the bird is cooked all the way through check the temperature in the breast, the inner thigh, and outer thigh. At every point the temperature should be at least 165 degrees F. If there is one (or more points) that is below temperature, roast for another 20 minutes before rechecking. ONE HOUR BEFORE COOKING: remove the giblets and neck from the inside of the turkey. Place the turkey, breast side up, in the roasting pan. Let sit for one hour to take the chill off the bird. 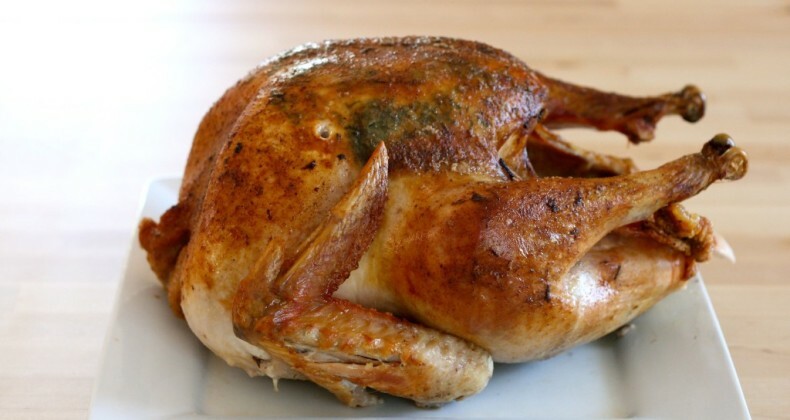 Place the turkey in the oven and turn down the temperature to 350 degrees F. Roast the turkey for 13 minutes per pound. Basting every 45 minutes. Start checking the temperature of the bird at the half-way point. Once the bird is up to temperature remove from oven and tilt it to drain out any juices from the cavity of the bird. Transfer the bird to a cutting board, tenting with foil, allow to rest for 30 minutes before carving. Now this is one gorgeous turkey! I should try this. My husband generally cooks the turkey. One time he left it up to me. I was so nervous that I was going to mess it up. I was nervous since it was my first turkey and friends were coming over for dinner but it really was a cinch to do. This looks fabulous! I’m so excited for Thanksgiving! Yum… totally craving Thanksgiving dinner right now! This year we’ll be going to Ohio for Thanksgiving, but next year when it’s my turn I’m going to be roasting up a turkey! I hope my turkey looks as delicious as yours does as I get the honors this year! I butter up the turkey like you do then I pop it in a bag like your mom does! I might have to give the bag a try at the actual Thanksgiving dinner.